The European Prize of Combinatorics 2017 was awarded to Christian Reiher (Univ. 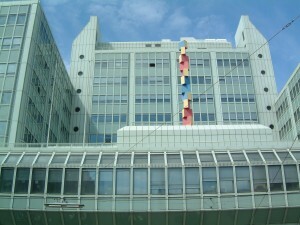 Hamburg) for his profound result in extremal and probabilistic combinatorics, particularly for his solution of the Kemnitz conjecture on lattice points and the Lovasz-Simonovits clique density problem and to Maryna Viazovska (EPFL) for her deep contributions to spherical designs and particularly for the solution of the sphere packing problem in dimensions 8 and 24. 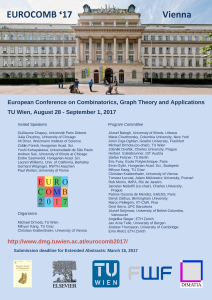 The prize ceremony took place at the TU Wien at the Opening of the Eurocomb 2017 conference on August 28, 2017. Both prize winners gave a prize lecture on August 30 as part of the Eurocomb conference. The award of 2500 EURO for 2017 is founded with contributions of DIMATIA, local organizers and Elsevier. The proceedings for Eurocomb 2017 are already published in Electronic Notes in Discrete Mathematics, Volume 61. Eurocomb participants will receive a USB stick with all contributions in pdf-format at Eurocomb registration. international jury. The award of 2500 EURO for 2015 is founded with contributions of DIMATIA, local organizers and Elsevier B.V. In the tradition of EuroComb’01 (Barcelona), Eurocomb’03 (Prague), Eurocomb’05 (Berlin), Eurocomb’07 (Seville), Eurocomb’09 (Bordeaux), Eurocomb’11 (Budapest), Eurocomb’13 (Pisa), and Eurocomb’15 (Bergen) this conference will cover the full range of Combinatorics and Graph Theory including applications in other areas of Mathematics, Computer Science and Engineering.